Royal Baby 3 Watch and Encampment Is on, but Where Is England? 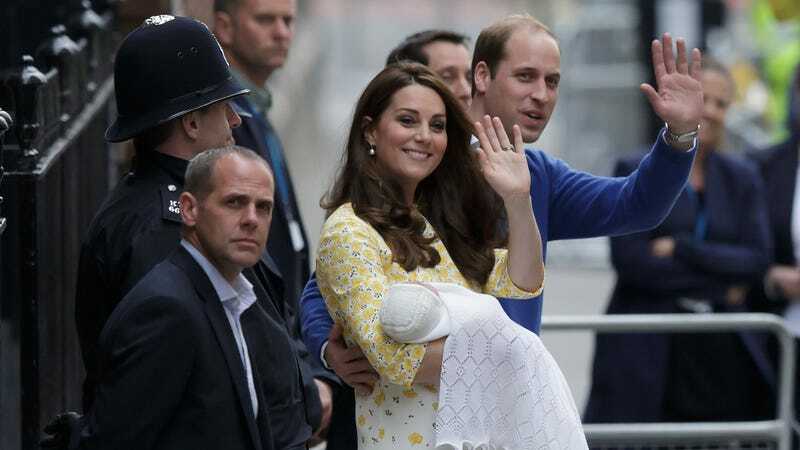 In behavior which Americans might call “stalkerish,” and the British call “well-wishing,” subjects are staking out St. Mary’s Hospital, where the next prince or princess is expected to blow out any day now. I’ve seen Mother, and I just blogged about Taylor Swift’s recently-apprehended “fan,” so from an American perspective this sounds scary af. Or, “barmy”! The upshot is that the full-blown royal mania of a crumbling empire serves a thoroughly amusing patriotic spectacle to the emancipated colonies the world over, and we’ve (I’ve) got the Michael Jackson-eating-popcorn-GIF all fired up. And what is this! Whereas parenting mags were sending interns to Royal Baby 1, and the world watched Twitter with an official hashtag #GreatKateWait of 2015, what we have here appears to be a small contingent described by People as: “superfans.” As ABC puts it, they are: “few” and “dedicated.” The birth has, as WFMY put it, gently, “taken something of a back seat” to Meghan Markle’s wedding preparations. “We come as soon as they put the parking restrictions on,” Maria Scott, 46, from Newcastle told ABC News, with a British flag tied around her shoulders like a cape. “I’ve done it so long, I know the routine, the helicopters and the motorcade” said Terry Hutt, 83, from Camden Town, whose dashing Union Jack suit has been a mainstay at royal events for decades. Did Amy Thompson ever think her mom was a bit nuts, honestly? “No, no,” Thompson says. “I’ve been brought up knowing everything about the family - and she’s always been this way. Everyone has their thing and this is ours.” Like her mother, she too, has become an ardent royal fan.